A 10-year-old boy was taken to his pediatrician due to intestinal symptoms, including diarrhea, after he returned home from summer camp. 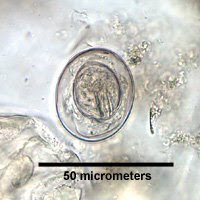 The physician requested several exams, including an ova and parasite (O & P) examination; the stool specimen was tested at a commercial laboratory where a concentration method was performed and wet-mount slide examined. One of the exams ordered by the physician was positive for a bacterial agent. 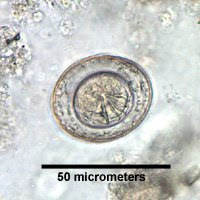 However, the objects seen in the images (below) (magnification 400×) were observed in the stool samples in low numbers. Please provide a complete identification of the objects in the images. Record your answers in the comments section -with the diagnosis (species level identification) and criteria for identifying.